Elaeagnus is a genus of ornamental shrubs, small trees and flowering plants from subtropical and temperate regions of Europe and Asia. Majority of the species are very adaptable plants that can be grown outdoors in almost every garden. Generally, the genus of Elaeagnus comprises of sun-loving plants that prefer fertile soil and regular watering. However, they can withstand long spells of drought too. The genus of Elaeagnus is better known for its fragrant flowers of silvery white color. Flowering is followed by formation of red berries that add to the beauty of these ornamental plants. Most species of Elaeagnus are used as specimen pot plants, as flowering shrubs or in hedges. Some of the popularly grown species include: Elaeagnus commutata (American silverberry), Elaeagnus multiflora (cherry silverberry or goumi) and Elaeagnus pungens. Elaeagnus pungens has various popular varieties characterizing variegated and colorful foliage. Commonly known as ‘Silverthron’, Elaeagnus pungens grows as a spiny shrub. It is a fast growing and evergreen shrub that produces dense foliage, white flowers and reddish-brown berries. The fragrance of white flowers is reminiscent of Gardenia. It is an adaptable plant that tolerates varied climatic conditions. Elaeagnus pungens is easily propagated from cuttings. Aloe haworthioides as it is commonly known is a beautiful and miniature variety of Aloe. The plant is a hybrid of Aloe descoingsii and A. hawothioides. Aloe haworthioides is an easy and fast growing plant that produces large clumps of miniature plants that grow very well in pots. The plant characterizes fresh green leaves marked with white spots and tiny bristles on their margins. 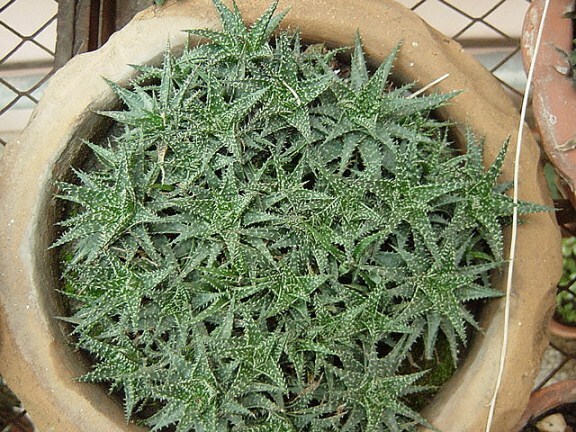 Aloe haworthioides is good as pot plant as well as an excellent choice for miniature gardens. It requires slightly moist but well drained soil. The plant can be grown propagated from divisions or seeds that germinate easily and form miniature plants quickly. Aloe haworthioides does not require much care and grows well under partial sun. Water generously when soil is completely dry in summer. In winter, keep these miniature plant protected from heavy frost and water barely sufficient to protect them from rot. Like other species of this genus Aloe haworthioides produces small tubular flowers on a long stalk. Spring flowers are orange-pink that attract a lot of birds to the garden. 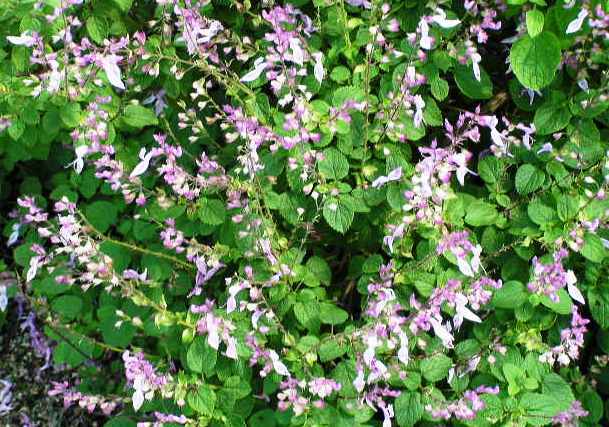 Orthosiphon is a genus of herbaceous shrubs from the family of Salvia and is known for its ornamental blooms. These drought tolerant shrubs especially Orthosiphon labiatus is a long blooming plant that forms a handsome shrub (up to 1 meter) for gardens and landscapes. Orthosiphon labiatus is known for its pink, tubular flowers that appear on upright stems of the plant to cover the entire plant in spring and summer. Flowers are usually purple-pink and emit a minty fragrance. This handsome shrub is perfect for mass plantation schemes to form large beds of decent foliage and spring blooms. Orthosiphon labiatus is known by many names – Shell Bush, Pink Sage, and Pink Cat’s Whiskers. It grows best in full to partial sun and requires regular watering. Lonicera is a wonderful genus of climbers, ground covers and shrubs grown for their foliage and fragrant flowers. The plants in the genus of Lonicera are usually known as Honeysuckles. The genus includes two major types of plants – bushes and climbers. 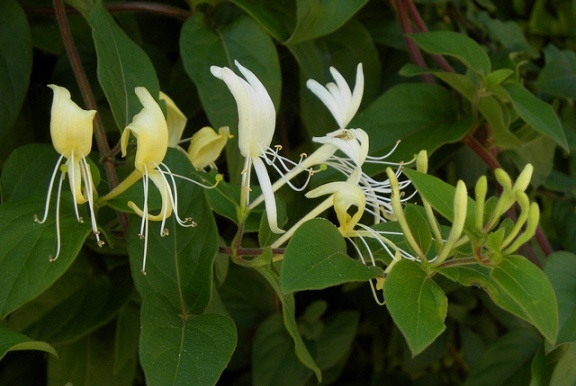 The bush type honeysuckles make decent shrubs that can be used for hedges or garden borders. The climber type honeysuckles are often grown against walls, pergolas or trellis. Both type of honeysuckles require proper pruning to keep them in good shape. Most honeysuckles would grow under bright sunlight and in a rich, moist but well-drained soil. Honeysuckles make good ornamental plants in small gardens as well as landscape designs where they grow under little care and produce unforgettably fragrant flowers in spring. 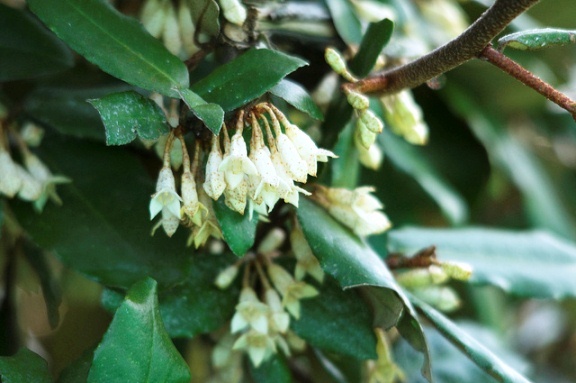 Lonicera japonica (Japan honeysuckle) is an evergreen climber with white tubular flowers that appear in spring. A variegated variety Lonicera japonica ‘Variegata’ is also available for cultivation. Lonicera caprifolium (Italian woodbine or goat-leaf honeysuckle) is a deciduous perennial that grows as vigorous climber (up to 8 meters). The plant produces abundance of strongly scented flowers of white and pink colors in midsummer. Lonicera hildebrandiana (Giant honeysuckle) is an evergreen climber with large leaves and flowers. The flowers are yellow or orange that appear in spring. Lonicera sempervirens is an excellent climber that produces decent foliage and tubular red flowers. Solandra maxima (Buy online), which is popularly known as Cup of Gold, is a vigorous and fast growing vine from tropical regions of Mexico, Central America, and South America. It is an evergreen and sprawling vine that prefers a well-drained soil and exposure to bright sunlight. Cup of Gold is usually grown against pergolas, trellis or walls because its thick and twinning stems require a sturdy support. As a fats growing vine, Cup of Gold can grow up to 40 meters or more, therefore, it should be regularly pruned to keep it in shape and under control. Cup of Gold produces wide, leathery leaves of dark green color. 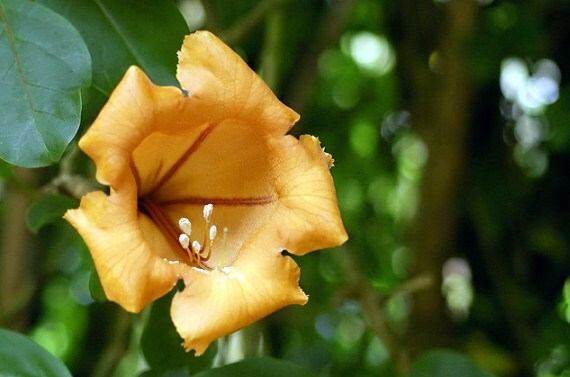 The bell-shaped flowers of Cup of Gold hang on woody stems. These attractive and prominent flowers closely resemble the flowers of Duranta. These lovely flowers are yellow when they bloom but as the time passes they eventually tend to appear deep golden, thus giving the vine its common name – Cup of Gold. These lovely flowers emit a decent fragrance. Cup of Gold vine is quite easy to propagate from layering. Young plants require regular water, however, as they grow they become quite hardy and withstand long periods of drought easily. Tweedia caerulea is an interesting twinning perennial from South America. This evergreen subshrub grows up to 1 meter or more and produces delicate flowers of turquoise color. The beautiful flowers give the plant many names like Southern Star, Heavenborn, Little Blue Star, and Blue Flowered Milkweed. Tweedia caerulea prefers full to partial sun and regular watering in ordinary but well-drained soil mix. Although evergreen, it is best to prune back the plant in early spring. A mature plant of Tweedia caerulea usually has dense foliage characterized by soft and felted leaves. 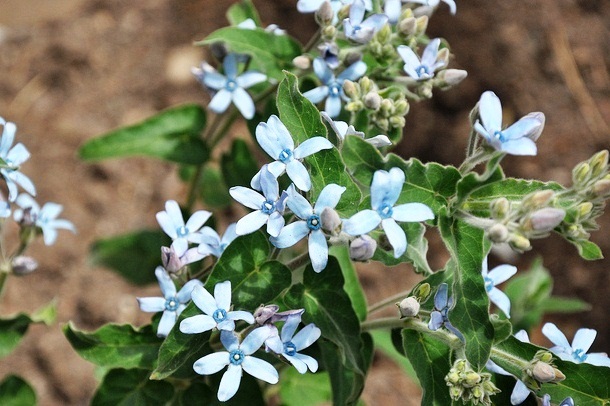 Easily grown from seeds, Tweedia caerulea is a good choice for gardens, wall-side borders and containers. Dierama is a small genus of evergreen perennials characterized by drooping flower stems and bell-shaped flowers. The plant is known among gardeners and horticulturists for its dainty and graceful flowers that can be easily recognized by their colors and delicate formation. Ideal for sunny borders or raised beds, plants in the genus of Dierama prefer fertile, loamy and moist but well-drained soil. The plants are easily propagated from corms planted in containers or raised beds. Most species of Dierama benefit from regular watering in summer but only moderate watering during winter. Flowers of all shades of pink, white and violet colors appear in later summer or early fall. The bell-shaped flowers grow delicately on a long, drooping stalk, thus giving the genus its common name Angel’s Fishing Rod. 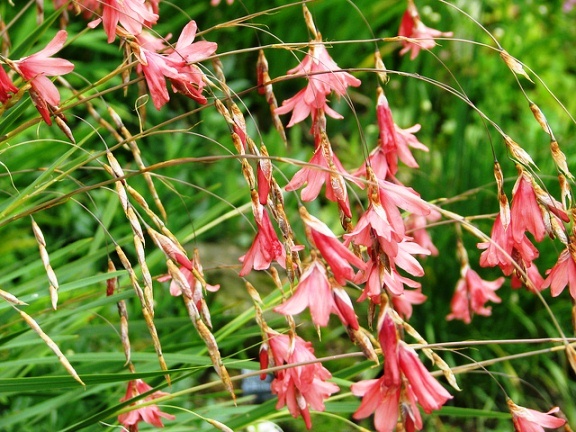 Dierama pendulum (Wand Flower) – Evergreen, cormous plant forming large clusters of grass-like leaves. White, mauve or pink flowers grow on tall spikes. Dierama pulcherrimum – Evergreen plant growing up to 1.6 meters; flowers of pink or reddish purple colors appear in summer. 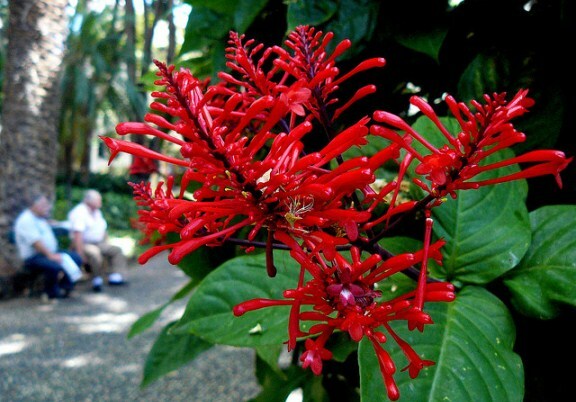 Ixora coccinea ‘Jacqueline’ is one of the many popular hybrids of Ixora coccinea. The plant is popular for its salmon orange blooms and evergreen foliage. Like other plants of the genus, Ixora ‘Jacqueline’ prefers a well-drained, loamy and slightly acidic soil. Suitable for outdoor plantation, this beautiful hybrid is a bit fussy about moisture and temperature. The idea place for Ixora ‘Jacqueline’ in a garden is a sunny spot where it receives bright sunlight but protection from frosty winters. Ixora ‘Jacqueline’ is characterized by glossy foliage and shrubby growth that can be easily control by regular pruning. Ixora ‘Jacqueline’ does not like being moved around and often drops flower buds when moved around. Clusters of showy flowers appear almost all through the summer. The plant benefits from general purpose fertilizer every fortnight during the flowering season. 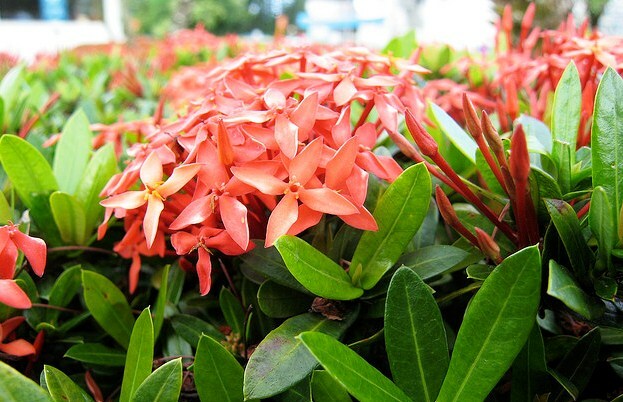 Ixora coccinea ‘Jacqueline’ has many common names including Jungle Flame, Jungle Geranium, Flame of the Woods, Needle Flower, and West Indian Jasmine. The plant in picture is Odontonema strictum which is a versatile and useful shrub for tropical climates. Known by the names of Firespike, Cardinal Guard and Scarlet Flame, Odontonema strictum is grown for its fresh green foliage and spikes of showy flowers. It is a good plant to grow in borders, landscapes or in empty spaces where it can spread quickly to fill in the space with a plenty of foliage and branches. The branches that grow from the underground can grow as high as 6 feet. However, it can be easily pruned to keep in proper shape and under control. Odontonema strictum originally belongs to the Central America but grown widely in many tropical regions of the world for its crimson flowers. The flowers usually appear in summer and attract a lot of butterflies and hummingbirds. In fact, it is any easy way to invite hummingbirds to the garden. Odontonema strictum is quite easy to grow as it only requires a good but well-drained soil. Young plants thrive well with regular watering but once established it can easily withstand spells of drought. It also does well under all light conditions but prefers filtered and bright sunlight. Odontonema strictum is propagated from seeds or softwood cuttings. Ricinus communis, commonly known as castor oil plant, is an interesting foliage plant for warm climates where it grows as a small tree (up to 5 to 10 meters). Castor oil plant is usually grown as specimen plant in landscapes for its striking foliage. In the growing season, the plant can be seen covered with new foliage of purplish-red color in contrast with older deep green color. The flowers are insignificant but the seeds pods are quite showy and colorful. Ricinus communis originally belongs to warmer climates of Africa and the Indian sub-continent, however, it is grown is many tropical and sub-tropical regions of the world. Though it makes a good plant for horticulture, Ricinus communis is an important medicinal plant as well. The seeds of Ricinus communis are source of castor oil which is widely used for many commercial purposes. It is used in preparation of fine quality lubricant for automobiles and other machinery. Castor oil extracted from the seeds of Ricinus communis is also used in manufacturing of paints, cosmetics and soap industry. Ricinus communis is a fast growing plant for warmer climates. In horticulture, various cultivars are grown as ornamental plants. 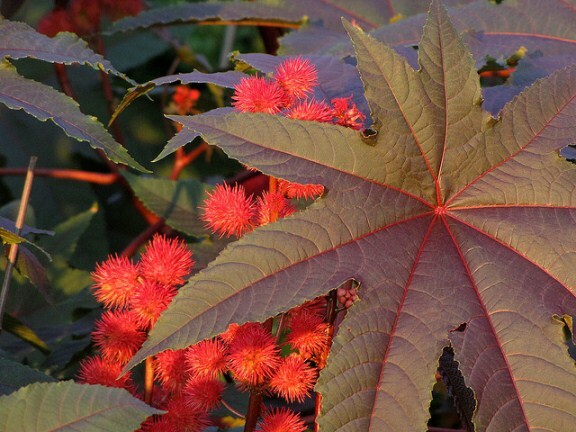 Some of the popular verities of castor oil plants include: Ricinus communis ‘Red spire’ (red stem and bronze foliage), ‘Impala’ (reddish foliage), and Ricinus communis ‘Gibsonii’ (reddish foliage and pinkish seed pods).